Our neighbor, Linda Knight, saw these wreaths, and thought how wonderful they would be over her kitchen entrance. 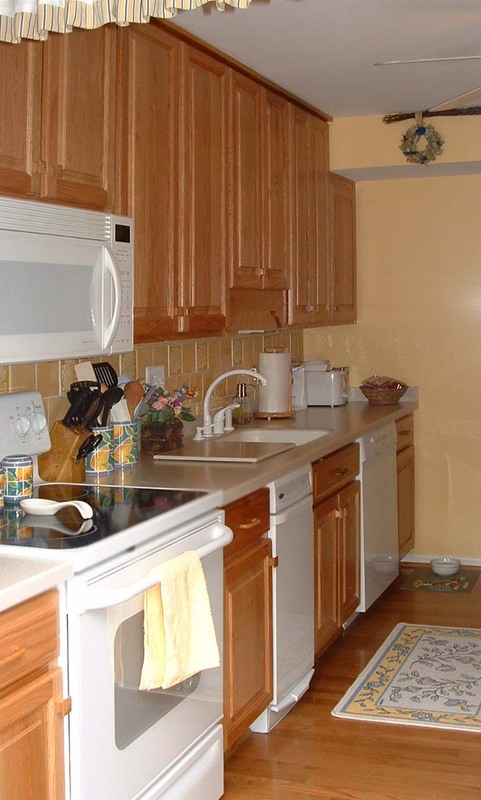 She had wanted to remodel her kitchen anyway -- now she had the color scheme and was off and running! Linda acted as the general contractor; choosing, and then overseeing, the installation of new floors, countertops, cabinets, lighting, appliances, window treatment, and tilework. Talk about a coordinating effort! In her kitchen, the space above the cabinets had just been wasted area, so she chose tall cabinets that extended to the ceiling. In some houses, that space is taken up by duct work, so this trick will not work for everyone -- check first! Linda also cleverly checked the depth of the new cabinets to make sure her china fit. It turns out not all kitchen cabinets have the same depth. The compactor was moved to the sink work area; this saves many steps while cooking. The cabinets are oak as is the flooring. Linda grew up in a home with wood floors in the kitchen, and loved them. She did not want the "manufactured" wood floors (such as Pergo) because they can be ruined if too much water gets on them. The counter-top is Corian, so is the cutting board -- chosen for looks and easy maintenance. She freed up counter space by getting an over-the-stove microwave. Notice the stove with flush burners, making cleanup so much easier. Do your remember when these stoves first came out? All you could use were special glass pots on them. Hers is good for anything but Corning Ware. For a gallery of pictures of Linda's new kitchen, click here.